French red velvet in red half-morocco case. Probably made for Pierre II Bourbon (1439-1503), his arms in borders (azure, on a semy of fleurs-de-lis or a cotice gules); M. Guyot de Villeneuve sale, Paris, Mar. 26, 1900, lot 6; purchased by J. Pierpont Morgan (1837-1913) before 1913; J.P. Morgan (1867-1943). 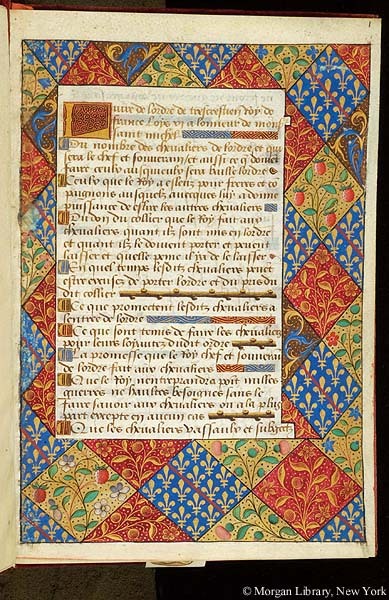 Ms. statutes; written and illuminated in Paris, France, ca. 1490. Decoration: 1 large miniature, 2 historiated initials, one with full border and border historiation. Artist: Chief Associate of Maître François.